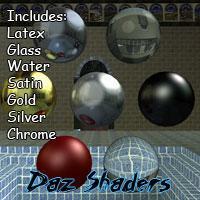 Can these be used in Commercial Renders, if they are not distributed as Shaders? eduardoflores (6 years ago) Inappropriate? They are working also for the new DAZStudio 4.6! Rockhog (6 years ago) Inappropriate? SpicyNiknak (6 years ago) Inappropriate? Thank you. These should be perfect. Thank you for these shaders! I love your shaders, they always gave me exactly what I was looking for...do you know if these will work in Daz4 Pro, there seems to be some question for former shaders and scripts still being useable with the new version. trekeyus (7 years ago) Inappropriate? do this work with daz4? Thank you for these fantastic shaders. I use your others often. Susina (8 years ago) Inappropriate? I downloaded these a while ago from your site and I just found them here again! I have been recommending these to people for quite some time as they are a great resource! On behalf of those to busy to leave a comment I thank you for making these (and the other set as well) available to the users of DAZ Studio. Thanks for sharing!